The séance is probably the most misunderstood and abused of all spiritual practices, and carries with it some very real dangers. The good news is that the authors of The Afterlife Healing Circle have corrected the disinformation while showing us how to avoid the dangers. The afterlife healing circle is a way we can safely communicate with those on the other side, whether they are loved ones who have passed or future offspring who have not yet been born. How to recognize when they or others need the afterlife healing circle. How to develop the intuitive senses that will enable them to connect with the other side. How, where, and when to conduct the afterlife healing circle safely. How the rules of physics prove that consciousness both survives and precedes the physical body. It’s never too late to say goodbye—or too soon to say hello. Inner shift specialist Candace L. Talmadge has been a professional writer since 1976. She has been a syndicated political columnist and written full time or freelanced for major print and online media. Candace publishes the Green Stone of Healing® speculative fiction series under the byline C.L. Talmadge. 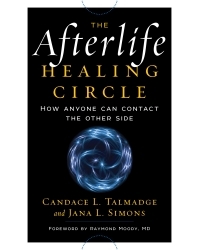 Connect with Candace at www.thehealingcirclebook.com. Jana L. Simons’ resume looks like it belongs to several people. She changed industries and fields numerous times until she found her true calling, teaching soul-sense development and a unique form of energy healing known as Sunan therapy. She also coauthored with Candace an exploration of emotional healing resolution through Sunan therapy. Connect with Jana at www.facebook.com/thehealingcircle.